The fares on this page are for the 7-night options – Option 1 Amsterdam to Nuremberg or Option 2 Nuremberg to Budapest and for Option 3 all 14 nights. To book Option 3, our 14-night cruise from Amsterdam to Budapest, please call our office at 718.504.0404 (or your travel agent) to make your reservations. Based on availability, of course, we will do our absolute best to secure the same room for you on both legs of the journey. indicates this category is STEP eligible. LEARN MORE about our Solo Traveling with Ease Program. Measuring 162 square feet, Emerald Staterooms are located on the Riviera Deck. The interior fixtures and amenities are identical to Emerald Balcony Suites. However, due to their lower deck position, Emerald Staterooms have a small fixed picture window instead of a balcony. All Staterooms are equipped with a flat screen TV with infotainment system, individual air conditioning system, a personal safe, fridge, hairdryer, hotel-style beds, an ensuite bathroom, complimentary WiFi, and bottled water restocked daily. Swipe chart left/right to see pricing grid. Or rotate phone to see larger view. Swipe chart left/right to see pricing grid. Emerald has put every effort into designing beautiful staterooms and suites, selecting the most elegant décor and furnishings to create a haven for you to relax in as you sail through the most picturesque landscapes. But with our Emerald Panorama Balcony Suite, they’ve gone one step further and created a completely new type of cabin that’s unique to river cruising. These spectacular suites boast Emerald’s revolutionary indoor balcony design, complete with decking area, table and chairs – generating an entirely new space for you to enjoy the landscapes you pass. With the touch of a button, the upper part of the cabin’s floor-to-ceiling window drops down to unveil uninterrupted views of the stunning scenery, opening up the cabin and bringing the outdoors in. You’ll also find a mini-fridge in your suite. It’s perfect for keeping your complimentary bottled water cool, too. Each of Emerald’s Grand Balcony Suites has a number of complimentary amenities, such as an in-suite Nespresso machine – an added home comfort that means that you can relax with a hot beverage at any time, day or night. You’ll also have the option to order a delicious continental breakfast to enjoy on your balcony. And for the perfect start and finish to your evening meal, you can enjoy pre-dinner canapés and after-dinner sweets courtesy of your exclusive room service, which is included in the price of your suite. Grand Balcony Suites also offer a spacious outdoor balcony, allowing you to make the most of your cruise’s beautiful landscapes and take in the fresh air. And should the weather take a turn for the worse, all it takes is the touch of a button and our state-of-the-art open-air system window rises from the balcony and encloses the area so that you can still sit out and admire the views or, better yet, unwind with a drink. Owner’s One-bedroom Suites boast their very own bedroom which closes off from the rest of the suite, a separate lounge area, and a fantastic outdoor balcony complete with open-air system, allowing you to enjoy the views of your surroundings whatever the weather. These suites also include a selection of special features, a spacious bathroom, a luxurious walk-in closet, a complimentary Nespresso machine, and a complimentary mini-bar restocked daily with wine, beer, and soft drinks. So that you can keep up-to-date with the latest news, you’ll have an iPad to use throughout your cruise. In order to offer a more intimate dining experience, you can order continental breakfast, pre-dinner canapés, and after-dinner sweet treats to enjoy in the privacy of your suite’s lounge or outdoors on your balcony. Port taxes and admin fees are 199 USD per person. Pre-Paid Gratuities are 99 USD per person. Solo guests in their own stateroom pay double gratuities and single port taxes/admin fees. For guests arriving December 5, 2019, transfers from Amsterdam’s Schiphol Airport (AMS) to the ship are included. 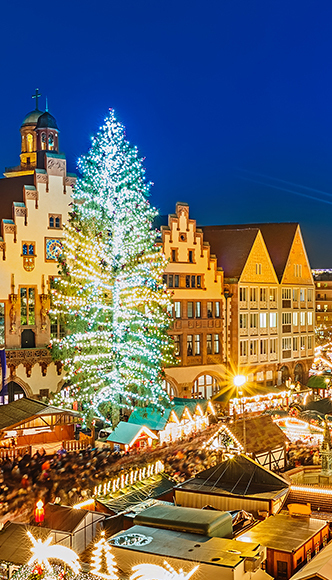 For guests leaving Nuremberg December 12, 2019, transfers from the ship to Nuremberg International Airport (NUE) are included. For guests arriving December 12, 2019, transfers from Nuremberg International Airport (NUE) to the ship are included. For guests leaving Budapest December 19, 2019, transfers from the ship to Budapest’s Ferenc Liszt International Airport (BUD) are included. 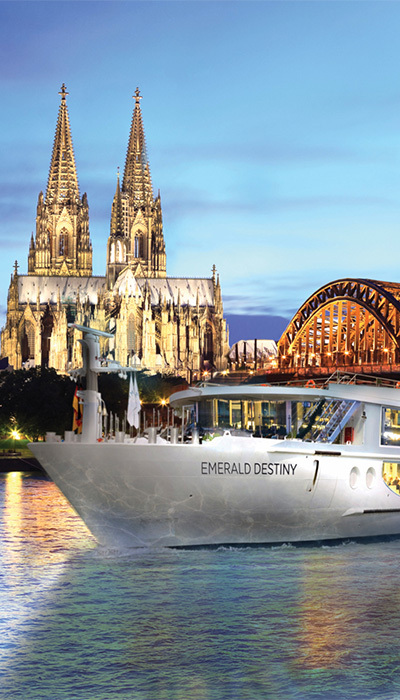 Room descriptions and sizing have been provided to us by Emerald Waterways. Room layouts may vary within the same category. Prices are subject to change at any time – with or without notice. Be sure to read VACAYA’s Terms & Conditions, which include the Payment/Cancellation/Refund Policies for all reservations. Please note that cancellation fees apply from the time of booking. For real-time availability, proceed by clicking BOOK NOW. With ever-shifting inventory, a category that shows availability on this page may no longer be available when you attempt to book. If you need help finding the perfect room in another category or to add your name to our wait list for a sold out category, feel free to call The Vacayans during standard phone service hours and we’ll be happy to assist you. You may pay in full at the time of booking. Unless you later modify your reservation, no further payments will be necessary. Your initial deposit is due at time of booking. Then, your remaining monthly payments will be calculated using the number of months between your booking and the final payment due date. Payments will be charged on the 15th or the last day of each month (determined automatically depending on the day of the month you book). Payments will be charged to your credit card on file. If your credit card details change at any time, simply update the info in our system prior to your next month’s payment date. Please note declined payments are subject to a convenience fee. Explore our Automatic Billing FAQs. The Minimum Payment Plan allows you to make installment payments on your cruise over time. The date you place your reservation will dictate your minimum deposit amount due and all future payments will be made according to the payment schedule located in our Terms & Conditions. Return to the overview page of our grand European adventure with Emerald Waterways. A river cruise is one of the most elegant and worry-free ways to travel. Onboard Emerald Destiny, all of your meals are included, as are standard cocktails, beer, wine, coffee, tea, and soft drinks. 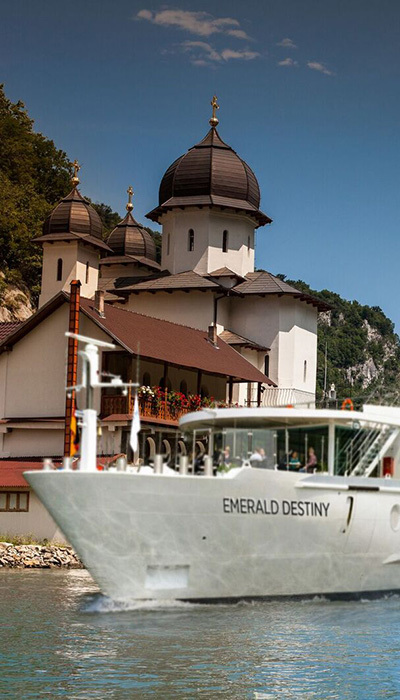 Emerald Waterways revolutionary “Star-Ships” aren’t like any other riverships. They’re designed to impress and inspire with every little detail, exceeding any expectation you have of what a rivership should be like.